Welcome Iowa Interstate Enthusiasts! The Unofficial Iowa Interstate Photo Archive and Railfan's Guide is dedicated to covering the past and present of Iowa Interstate (IAIS), one of the older and more successful of America's regional railroad spin-offs. Born from the ashes of the Chicago, Rock Island & Pacific in 1984, Iowa Interstate operates about 500 miles of railroad, centered around the ex-CRIP main from Bureau, IL, west through the Quad Cities and Des Moines into Council Bluffs, IA. Additionally, they reach eastward to Blue Island, IL, via CSX and Metra trackage rights, and south to Peoria, IL, as well as operating several small branches off the main line. This site is meant to assist already avid IAIS enthusiasts, encourage new ones, and provide information to those just dropping in for a visit. For you HO scale modellers, Intermountain has announced their first run of HO scale GP10 locomotives... and in the mix are four IAIS road numbers. They'll be doing the frog-eyed variants first, with IAIS 401, 413, 451, and 484 in the phase III paint scheme. The whole announcement can be found [here]. CEDAR RAPIDS, IOWA, March 30, 2012 � Iowa Interstate Railroad, Ltd. (IAIS) today announced the promotion of Dennis H. Miller from President & CEO to Vice Chairman of the Board, effective March 31. Miller, who has been President since 2002, joined the company in 1985 and previously served as Vice President of Information Systems, Customer Services and Operations. His railroad service also includes 10 years with the Peoria and Pekin Union Railway and 2 years with the Chicago, Rock Island and Pacific Railroad. Mr. Miller also served as President of Rail Traffic Control, a company that marketed computer-aided dispatching software in the U.S. and around the world. During his tenure as President, IAIS grew from 45,000 to over 125,000 carloads annually and oversaw capital improvements in excess of $100M. The company is also one of the safest railroads in the country, having won three E.H Harriman awards, including 2 Gold medals. Jerome P. Lipka will succeed Miller as President and CEO. Mr. Lipka joined the company in 2008 as VP and Chief Financial Officer. He was promoted to Executive Vice President�CFO in 2011. Prior to joining IAIS, Mr. Lipka served 8 years as CFO for the Arkansas and Missouri Railroad and its sister company, Allied Enterprises, Inc. His other prior railroad experience includes 7 years at the Chicago and North Western Railway and 2 years at BNSF. Mr. Lipka also served as CFO for a large governmental concern and an engineering company in the Chicago area. He started his career with Arthur Andersen & Co. in Chicago (11 years) after graduating with his MBA in Finance and Accounting from Northwestern University�s Kellogg Graduate School of Management. 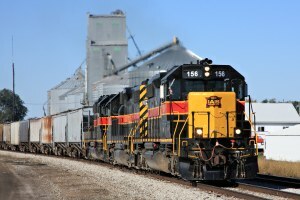 Founded in 1984, IAIS is a regional rail carrier operating over 500 miles between Omaha, Nebraska, and Chicago and Peoria, Illinois with connections to all Class 1 carriers. For more information about IAIS, please visit www.IAISRR.com. IAIS is a subsidiary of Railroad Development Corporation, a privately held Pittsburgh‑based railway management and investment company with worldwide interests. For more information about RDC, please visit www.RRDC.com. The Iowa Interstate Railroad and Patriot Renewable Fuels, Inc will be participating in Geneseo's Annual Planes, Trains & Automobiles event on Saturday, September 10, 2011. New and exciting for this year will be the addition of 3 train rides pulled behind a 2-10-2 coal fired steam locomotive. The train will travel from Geneseo to Annawan and back, roughly an hour and a half round trip. Departure times offered are 9:30AM, 11:45AM and 2PM. Tickets for the Annawan Excursion are just $12.50 for adults and $6.25 for children 2-12. Kids under 2 are FREE. For more information or to purchase tickets, please contact the Geneseo Chamber of Commerce at 309-944-2686. Be a part of history and take advantage of this unique opportunity. IAIS 6988 is expected to be positioned on the west end of the train with Patriot Fuels (ex-IAIS) 250 positioned on the east end. Several of the RRDX commuter coaches will be used on the train. Want to receive IAISRailfans.org news updates via email? Send email to majordomo@iaisrailfans.org with subscribe iais-updates ''in the body.